The U.S. dropped a bomb with an explosive force equal to 11 tons of TNT on a cave complex used by the Afghanistan branch of the Islamic State of Iraq and Syria (ISIS) on Thursday, the Pentagon said. The bomb is officially called a GBU-43 or Massive Ordnance Air Blast (MOAB), the origin of its nickname as the “mother of all bombs.” Weighing more than 21,000 lbs., the weapon is the largest non-nuclear bomb ever used in combat. The bomb was aimed at the center of an ISIS cave complex in Afghanistan, CBS News national security correspondent David Martin reports. The bomb set off a massive pressure cave that would have crushed the life out of any fighters hiding in the cave, and it sent a mushroom-like cloud into the sky, Martin reports. General John Nicholson, the U.S. Commander in Afghanistan, said he used the bomb so Afghan troops and their American advisers wouldn’t have to go in on the ground to clear out the caves. There are an estimated 600-800 ISIS fighters in Afghanistan, most of them located in Nangarhar province, near the Pakistan border. The strike had been in the works for a number of months, dating back to the Obama administration, which is when the bomb itself had been moved into Afghanistan. The authority to use the bomb had been delegated to Nicholson, although he notified Washington in advance, Martin reports. Nicholson sought and obtained permission to use the MOAB, but it’s unclear how far up the chain of command his request traveled, Martin reports. Former Afghan president Hamid Karzai tweeted his anger at the strike, posting in a series of tweets that he “vehemently” opposed the U.S.’s action. Earlier at the daily White House briefing, press secretary Sean Spicer declined to say whether Mr. Trump had personally authorized the use of the weapon. Spicer said that the strike targeted a “system of tunnels and caves that ISIS fighters used to move around freely.” He said the U.S. “took all precautions necessary” to minimize civilian casualties. A U.S. soldier was killed in combat during an operation in Nangarhar just days before. In a statement, the U.S. command in Afghanistan said the strike was “designed to minimize the risk to Afghan and U.S. Forces conducting clearing operations in the area while maximizing the destruction of ISIS-K fighters and facilities,” using the term for ISIS’s Afghan contingent. Officials “took every precaution to avoid civilian casualties with this strike,” the statement said. In March 2003, the U.S. military debuted the 21,600-lb. MOAB during a test in Florida shortly before the invasion of Iraq. The test was intended to demonstrate the “enormous incentive” Iraqi dictator Saddam Hussein had to relinquish power and “spare the world a conflict,” then-Defense Secretary Donald Rumsfeld said at the time. 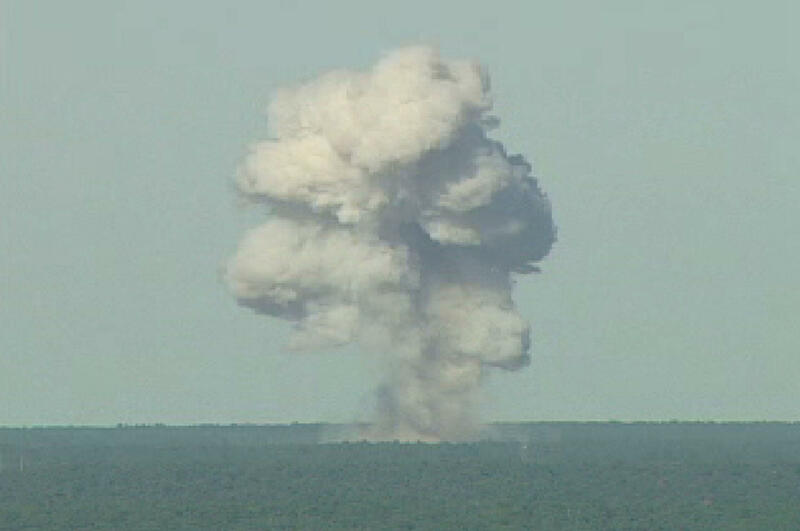 The cloud of debris from the ensuing explosion in the 2003 test was visible from more than 20 miles away, according to the Air Force. U.S. and coalition forces invaded Iraq nine days later, and a MOAB was deployed to the region on April 1, 2003, but never used. In this handout provided by the Department of Defense, A Massive Ordnance Air Blast (MOAB) weapon is prepared for testing at the Eglin Air Force Armament Center on March 11, 2003, in Valparaiso, Florida.